With the support from Deutsche Gesellschaft für Internationale Zusammenarbeit (GIZ) Economic Cooperation in Sub-Regional Initiatives in Asia (SCSI), the Knowledge Management Framework for GTI is under steady and gradual development, which aims to strengthen institutional capacity of GTI Secretariat and to support member countries to increase their capabilities to effectively implement GTI Program by leveraging priory Knowledge Management activities. As an important initial step of the formulation of Knowledge Management Framework for GTI, this progress meeting laid a foundation by identifying the key concepts of Knowledge Management for GTI and completing the GTI Knowledge Management Action Plan. Knowledge Management Specialist hired by GIZ as the expert first introduced the practical definition, objectives, approaches and guiding principles of Knowledge Management for GTI. 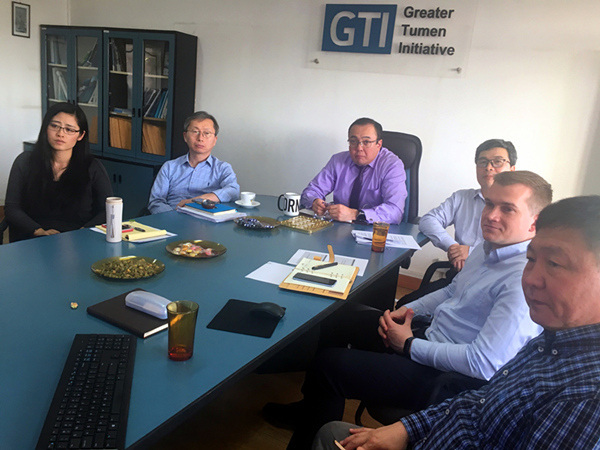 Further, members of the GTI Secretariat engaged in a constructive discussion with the expert on GTI Knowledge Management Action Plan. All participants actively exchanged ideas and thoughts on development and implementation of Knowledge Management Framework for GTI. Based on the discussion during the meeting, the Knowledge Management Action Plan (2019-2020) will be further modified and complied.